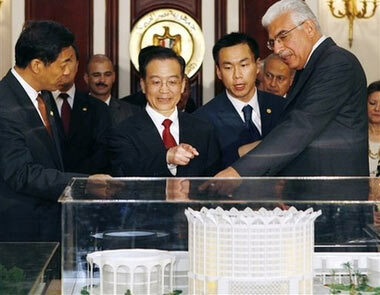 Speaking at a news conference in Cairo at the start of a tour of seven African nations, Wen said China's foreign policy was based on mutual benefit, adding that his country would not interfere in internal matters such as human rights. "This attempt and efforts to develop relations are not directed at entering into any alliance, and will not compromise the interests of any other countries. I am confident that the U.S. government also recognises this," Wen said. He was speaking through an English interpreter. Wen is the third high-ranking Chinese official to visit Africa in six months. Western commentators and rights groups worry that China may obtain African resources. During the news conference, held after a meeting with Egyptian President Hosni Mubarak, Wen reiterated China's position on non-intervention. Wen said "We follow the principle of mutual respect, equality, mutual benefit and non-interference in others' internal affairs in our relations with African nations." "There is no way that someone could ever put the hat of neocolonialism on the head of China," he said, adding that China had given billions in aid to Africa and had sent thousands of medical and technical personnel to help with aid projects. Wen's brief visit to Egypt, where Chinese and local officials signed agreements on communications, trade and energy, ended on Sunday when he flew on to Ghana, to be followed by Congo Republic, South Africa, Angola, Uganda and Tanzania. Besides outlining China's plan to increase commodity and energy imports from Africa, Wen said negotiation was the best way to solve the Iranian nuclear dispute and called on Israel and the Palestinians to return to the "road map".